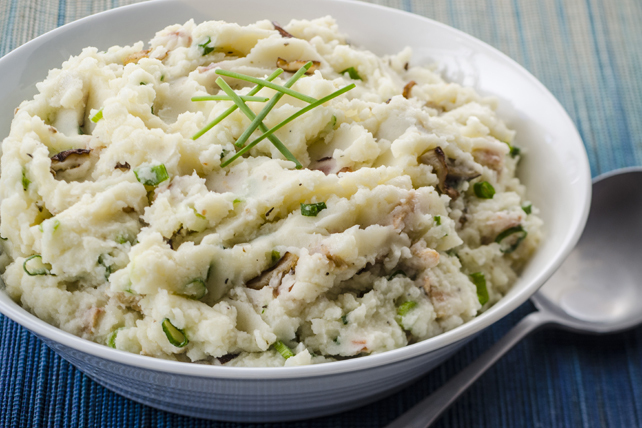 Mashed potatoes are a classic comfort food. The bacon and shiitake mushrooms add an interesting twist to this satisfying side. Meanwhile, cook and stir bacon in large nonstick skillet on medium-high heat 5 min. ; drain. Return bacon to skillet. Stir in mushrooms; cook 3 to 5 min. or until bacon is done and mushrooms are softened, stirring frequently. Add marinade; cook and stir 1 min. Remove from heat. Microwave milk 1 min. or just until warmed. Drain potatoes; place in large bowl. Add butter, pepper and milk; mash to desired consistency. Stir in onions and mushroom mixture. Prepare using button or cremini mushrooms. Garnish with 1 Tbsp. chopped fresh chives before serving.